The Rock & Roll Hall of Fame is a flawed system, and an institution of its kind sometimes feels antithetical to the rock ’n’ roll ethos. However, its nominations and inductions still carry weight, especially among rock fans. The nominations are chosen by a Rock Hall committee and inductions are chosen by a combination of committee and fan votes. Placing power in the public’s hands often means the most commercially successful acts get in the door first, rather than the most influential, but as for this year’s nominations, we can’t really complain. There are some younger faces in Radiohead and LL Cool J and major legacy acts like Stevie Nicks, Def Leppard and Janet Jackson. 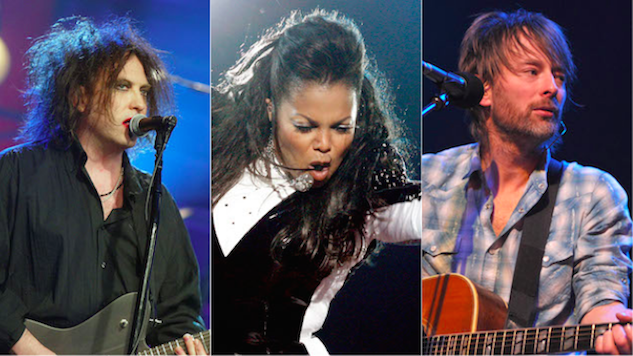 Paste gave a breakdown of each of the 15 nominations for the 2019 Rock & Roll Hall of Fame class. Typically, five or six nominees get inducted in December of each year. We’ve listed all the acts in alphabetical order, predicting who’s going to make it in and sharing who we want to win for next year’s class. It’s time to apply your eyeliner and spike your hair like Edward Scissorhands because according to the current fan vote, it looks like The Cure will finally join rock’s most prestigious club. The Cure have topped lists of Rock Hall snubs for several years now and it appears the melancholy alt-goth rockers will finally get the recognition they deserve. Few bands in history made better moody rock than Robert Smith and company. Albums like Seventeen Seconds and Disintegration captured their dark despair and beautiful, melodic atmospherics, but they also managed to release radio-friendly singles like “Friday I’m in Love” and “Just Like Heaven.” This is their second nomination, and it’s about time that one of the most influential groups of the ’80s made it into the Hall. Love them or hate them, Def Leppard are unequivocally one of the world’s most successful rock bands. They’ve sold more than 100 million albums, produced multiple Top 10 hits and, nearly 40 years after their debut record On Through The Night, they’re still touring to millions of fans. When you also consider the struggles they’ve faced as a band (namely, drummer Rick Allen losing his left arm in a car crash in 1984), and iconic songs like “Pour Some Sugar on Me” and “Rock of Ages,” the argument for their acceptance into the Hall of Fame is even more compelling. As of this writing, they were ranked #1 in the fan vote, ahead of Stevie Nicks by more than 100,000, so the likelihood of their induction is almost absolute. Though this is only their first nomination, Def Leppard have been eligible since 2005. This was inevitable, people. We might as well pop Hysteria on the turntable, crank it up loud and sweetly sing “Pour Some Sugar on Me” until the cows come home—or at least until hair metal becomes a thing again. Don’t cast Devo as a one-hit-wonder. This is only their first nomination to the Rock & Roll Hall of Fame, but the New Wave groovers deserve to get in now. However, they probably won’t. They are master genre-benders, hitmakers and influencers. They were defying genre as early as 1978, with their art-rock bonanza Q: Are We Not Men? A: We Are Devo!, and then, a few years later, they began to cement themselves in music history: Devo’s 1980 album Freedom Of Choice is home to the band’s biggest hit, “Whip It,” a song folks surely would have called a “banger” if such a term had existed in 1980. Their influence is undeniable. Yet, it’s unlikely 2019 is their year: They’ve racked up more than 100,000 fan votes, but that’s not quite enough, landing them at #7. Critics are more likely to appreciate Devo’s New Wave influences than fans. Someone pass the red energy dome hats, please: We need to “whip” away our sorrow. Janet Jackson has been nominated for the Rock & Roll Hall of Fame three times—in 2016, 2017 and now—and it seems like this could finally be her year. She’s stacked at #6 on the fan vote, just behind The Cure, and she also has a popular recent release—this year’s collaborative single with Daddy Yankee, “Made For Now”—to give her some sway. Jackson is a pop star with more winning tracks than many of the guitar-rock bands on this list: She has produced 10 no. 1 hits and 27 Top 10 hits throughout her career. Perhaps even more impressive is that those hits span three decades: “What Have You Done For Me Lately” peaked at #4 in 1986, but Jackson has secured spots on the Top 40 charts throughout the ’90s and ’00s, too. She’s also only one of two women on this list, joined by Stevie Nicks, so hopefully they’ll both make it this year. In terms of influence, record sales and pure, excellent output, few other nominees challenge Janet Jackson. Our predictions regarding John Prine’s 2019 Rock & Roll Hall of Fame fate are perhaps the least fun of all to deliver. John Prine is without-a-doubt one of the most influential songwriters (not just musicians here, but real, raw lyricists) in country, folk, Americana and beyond: Artists across genres reference him as a musical forefather (Australian pop-folk duo Oh Pep! are just one recent, left-field example). He has been releasing music since 1971 and even, at 72-years-old, dropped an excellent album this year, The Tree of Forgiveness. But, despite all that, his chances of making it into the Hall of Fame are not looking good: He’s currently fifth from last in the fan vote (What is wrong with you people?!). But, as they say, “It’s an honor just to be nominated,” and Prine’s music will always be special no matter what acclaim he acquires, or doesn’t. His sharp sense of place, acute wit and knack for telling stories of all kinds have already earned him a place in our hearts. Only one other on this list, LL Cool J, has been nominated for the Rock & Roll Hall of Fame as many times as Kraftwerk. They’ve both been nominated five times, and it’s doubtful that either will land an inductee spot in 2019. Kraftwerk is second-from-last on the fan vote roundup. They only have two songs that even scraped the surface of the U.S. Hot 100, 1975’s “Autobahn” and 1978’s “Trans-europe Express.” But, if you’re basing your Rock Hall opinions mostly on influence, the case for Kraftwerk is strong: the German group’s rhythmic, electronic synthpop preceded the majority of the new wave movement by several years. In addition, they were worldwide successes. Though they weren’t necessarily showstoppers on the U.S. charts, they were huge in Europe and the U.K. However, their induction, worthy as it may be, doesn’t seem likely. Rappers may be the equivalent of modern rockstars, but they don’t have a great history with the Rock & Roll Hall of Fame. The only recent rap inductees were Tupac in 2017 and N.W.A. in 2016. Though it’s his fifth nomination, and though his influence on rap is unarguable, LL Cool J’s chances seem slim. He does have some strong crossover appeal, having been favorable with rap audiences and beyond, so there’s still hope for him in 2019. But, more than likely, due to his low-ranking spot on the fan vote, he’ll make it onto the Rock Hall wall another year. Michigan rockers MC5 are one of those groups that influenced an entire generation of bands, but didn’t necessarily garner the commercial acclaim of their peers. Fans of garage rock, punk and back-to-basics rock ’n’ roll know their live album Kick Out the Jams by heart and their left-wing, anti-establishment lyrics soundtracked the early ’70s, when flower-power and the counterculture were in full force. MC5 have been eligible for the Rock Hall since 1991, and this is their fourth nomination. They’re undeniably deserving of an induction, but their Rock Hall future is sadly uncertain at this point. Radiohead are easily one of the most head-turning picks from this year. 2017 was their first year of eligibility and this is their second nomination. They certainly would be one of the youngest groups in the hall, alongside bands like Green Day, Beastie Boys, Nirvana and Red Hot Chili Peppers. Radiohead’s one-of-a-kind Kid A and OK Computer have been deemed modern classics, and the band’s shape-shifting alt-rock has continued to receive praise with recent releases like In Rainbows and A Moon Shaped Pool. According to the current standings, they won’t sneak in the Hall this year, but they will undoubtedly reach the promised land one day. The 2019 induction of Rage Against the Machine, while not entirely far-fetched, seems unlikely because this is only their second year of eligibility. However, they have been nominated both years, so maybe they’ll surprise us. On the flipside, they’re stacked against veteran rock stars like Def Leppard, Stevie Nicks and The Cure who probably have a better chance than Rage, if only for their ages. While their influence on rock and metal (specifically of the alternative variety) is undeniable, 2019 just isn’t their year. Though Roxy Music were extremely influential, they’re definitely a long shot for next year’s Rock Hall class. Led by Bryan Ferry, Roxy Music accomplished a rare feat—their art-pop and glam rock had an avant-garde, art-school edge with commercial appeal. They were beloved from the get-go by U.K. listeners and they slowly but surely built up an American fanbase with their popularity peaking with a U.S. Platinum album—their final LP Avalon. They’ve been eligible for the Rock Hall since 1997, but this is their first nomination and though they likely won’t make it this year, this likely won’t be their last nomination. Rufus were one of the most successful funk groups of all-time. With hits like “Do You Love What You Feel,” “Sweet Thing” and the Stevie Wonder-penned “Tell Me Something Good,” their sound was raw, sensual and emotive, and though they were best known for launching the career of Chaka Khan, they had a string of hit singles on the pop and R&B charts throughout the ’70s and until Khan’s departure in 1983. They won’t make it into the esteemed Rock Hall club this year, but this is just their third nomination, and sooner or later they should find their way into those hallowed halls in Cleveland. This one seems like a no-brainer. As the frontwoman of Fleetwood Mac, who are already inducted as a band, Nicks has been a commanding force in music for the last 40 years. As a solo artist, too, she has been a pop titan. There’s some question as to whether or not she can get in on her solo career alone, though, as it mostly flourished during the ’80s and early ’90s. But that shouldn’t matter here, and it doesn’t, to the voting fans (Nicks has almost 400,000 votes). Stevie Nicks is one of the most iconic rockers (and heartbreakers) in history, and she deserves to get in on this her first nomination. Stevie’s got this. It’s hard to think of another back catalogue to mirror Todd Rundgren’s prolific, eclectic career. The songwriter, multi-instrumentalist and producer made music that fluctuated from tender power-pop and experimental lo-fi to grand prog-rock, and he also made a name for himself with production credits like Badfinger, The Band, Hall & Oates, New York Dolls and more. Rundgren has been eligible for the Rock Hall since 1995, but this is his first nomination, and according to the fan vote, Rundgren is a lock to make it into next year’s class. English rockers The Zombies were one of the defining groups of the British Invasion and their influence spanned far beyond that period and sound. Their best-known record Odessey and Oracle was a psych-pop masterpiece, boasting cuts like “Time of the Season,” “Butcher’s Tale (Western Front 1914)” and “Care of Cell 44.” In fact, next year’s induction ceremony will take place on March 29, the same day “Time of the Season” went to number one on the charts in 1968. Coincidence? This is their fourth nomination, and according to the current standings, they will finally get the nod this year.